Generally speaking I try to avoid reading anything about a show, especially reviews, before I’ve seen it and written about it as despite the best of intentions, one always ends up parroting certain views as one’s own and this blog is meant to be about my opinion on shows. But the internet and Twitter in particular makes that increasingly difficult these days and earlier this week I’d been notified of Billington’s 5 star review for the Guardian and the tantalising promise of a ‘glistening torso’ which meant my already-keen anticipation for the Donmar Warehouse’s Anna Christie increased just that little bit more! As part of his farewell season, Michael Grandage is pulling out the big guns and this features the return of two big name alumni for the Donmar – Jude Law has been getting much of the attention, he was an excellent Hamlet in the Donmar's West End season, but also Ruth Wilson, slightly less heralded though criminally so, as she is one of the brightest acting talents we have in this country, her Stella in A Streetcar Named Desire earning her an Olivier. 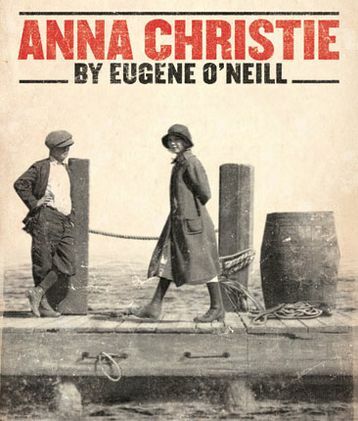 But to the play: Anna Christie is a 1921 Pulitzer Prize-winning work by Eugene O’Neill about the return of a young Swedish woman – Anna – to her father’s side after he sent her away at the age of 5 to distant family relations. He’s working on a coal barge and so she joins him in the hope of finding a better life as the idealised family life he thought he’d given her couldn’t be farther from the truth. When they rescue a crew from a shipwreck, including the charismatic Mat, there’s a tussle between the two men for her affection though Anna’s future finally seems to be looking up, but the secrets from her past will not stay buried and threaten everything. Last seen here breaking my heart with readings of WWI poetry, Ruth Wilson is simply exceptional as Anna: combining the spiky independence of a woman forced to grow up too quickly with the touching realisation and subsequent willingness to subtly change, to allow the potential for happiness in her life whilst not wholly surrendering her destiny to anyone else. As the wiry seadog Chris, David Hayman gives an intensely fierce reading of a man confronted with the reality of fatherhood rather too late and struggling to deal with the woman that the 5 year old in his mind’s eye has become. And completing the triumvirate of stellar acting performances is Jude Law who is expectation-confoundingly excellent: he subsumes himself so totally into the role of Mat that he is barely recognisable as the Hollywood actor he became. The transformation is partly physical, a full beard and an outrageously muscular physique (which does indeed glisten), but it is so much more than that too. There’s a masculinity, an explosive virility that seeps from him, shot through with a quirkiness of Irish charm, he’s as likely to throw a chair against the wall as he is to dance a little jig of delight and it is just captivating to watch. Ashford and his creative team feel like a breath of fresh air in the Donmar, using the stage in an extremely inventive way – though one might posit that Paul Wills’ caught the Young Vic’s recent I Am The Wind... – to evoke life on the water, the storm in particular is very well mounted. But in what is effectively a three-hander, Ashford also shows an intelligent use of space to show the way the protagonists relate to each other. Though an intimate theatre, the emotional distance feels vast at times, adding a beautiful frisson to the moments when they do finally come together. The supporting cast add atmosphere with their small cameos and sea-shanty singing and the overall effect is stunning. My only little thing was with the accents. O’Neill specifies particular accents for his lead characters and I have to admit to finding them quite challenging. One does gets accustomed but they are just so ‘present’ in the performances, almost a distraction, that it took me until the end of the third act to really forget that Wilson and Law were using them no matter how naturally they were delivered; Hayman’s bizarrely unique (and barely intelligible) sound though never managed to transcend – every time he spoke I first thought to myself, what an odd noise he is making, before paying attention to try and decipher what he was saying. Despite this small issue, I couldn’t recommend Anna Christie more, seriously think about tracking down returns or day-seating. A fantastic production which elevates an intriguing play to pretty much must-see levels with some outstanding acting performances – expect to see Law and Wilson much rewarded come nomination season. A tale of the power of love and forgiveness, its recognition of human frailty but also the facility to move on and grow lends this a persuasiveness that is hard to ignore.